The New York Public Library recently followed a copy of “Breakfast at Tiffany’s” through their library system, recording in detail the odyssey it took from when a patron put it on hold to when it was checked out. We thought this was a really wonderful idea, and while our library system is exponentially smaller than NYPL, we wanted to share the same kind of journey with all of you. 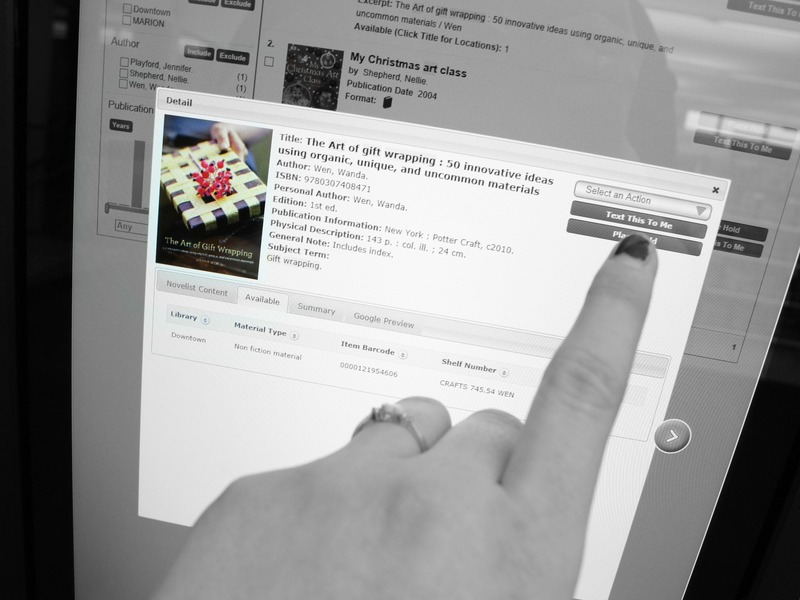 The first step was to log onto the Cedar Rapids Public Library catalog and choose a book. Because it’s the holiday season, we wanted something fitting, so we chose “The Art of Gift Wrapping: 50 Innovative ideas using organic, unique and uncommon materials” by Wanda Wen. We can place this item on hold directly from the catalog station in the library (seen here at our Downtown Library) or from your computer or mobile device (download the MLN2GO app from iTunes or the Bookmyne app from the Google Play store). We have the option to choose where to have the item picked up and we’re asking to pick this item up at the Ladd Library (3750 Williams Blvd SW). Our collection of materials is shared not only with our two branches but also with neighboring libraries in Marion and Hiawatha. That means our books, movies, and cds all travel from library to library via courier to meet the demands of our patrons. Last year we circulated more than 1.5 million items in our libraries alone, and 173,174 items were placed on hold in Cedar Rapids while over 287,980 items were placed on hold in the entire Metro Library Network. Because our item was available and not waiting for another patron, our hold will be pulled the next day. Each morning before we open at 9 am, a report is generated from our system listing each requested hold, and our wonderful volunteers use this list to locate the items and pull them from the shelves. Once they’re pulled from the shelf they head to our sorter room. The downtown library has a collection of over 150,000 materials, a mix of all types of offerings. 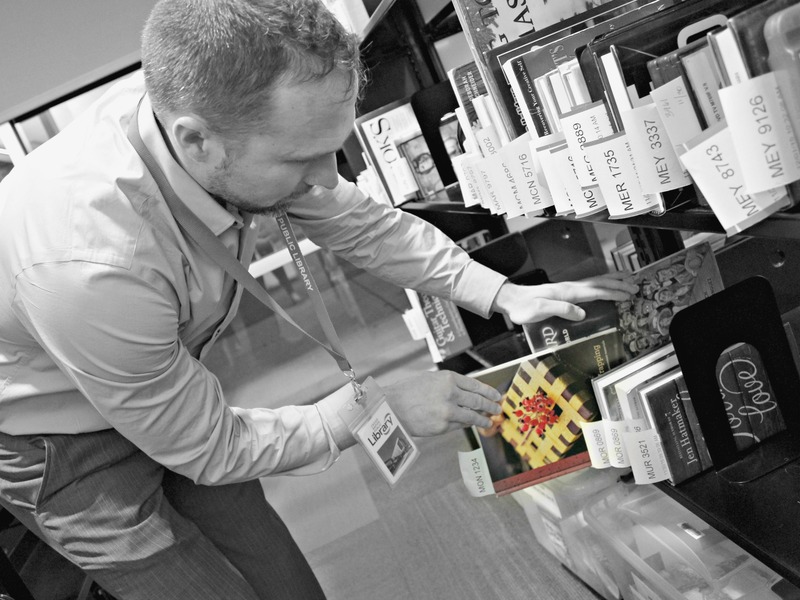 The collection of materials is maintained by staff who choose items based on reader requests, demand and shelf space. Holds, once pulled from the shelf, are put onto the library’s sorter. The sorter is a system of conveyor belts and computers with RFID technology that “traps” the item for the patron and notifies the person that their hold is available. Because we want to pick up our book at the Ladd Library, it is placed into a bin slated for the Ladd Library by the time we open our doors at 9 am. The bin holding “The Art of Gift Wrapping” is picked up by our courier before 11 am to make the four mile trek to the Ladd Library, with stops at local HyVee Stores to pick up items from those book drops. The library contracts with Per Mar to act as our courier. Last year, 356,297 items moved from one Cedar Rapids library to another via courier. The courier arrives before noon at the Ladd Library to deliver the bins. 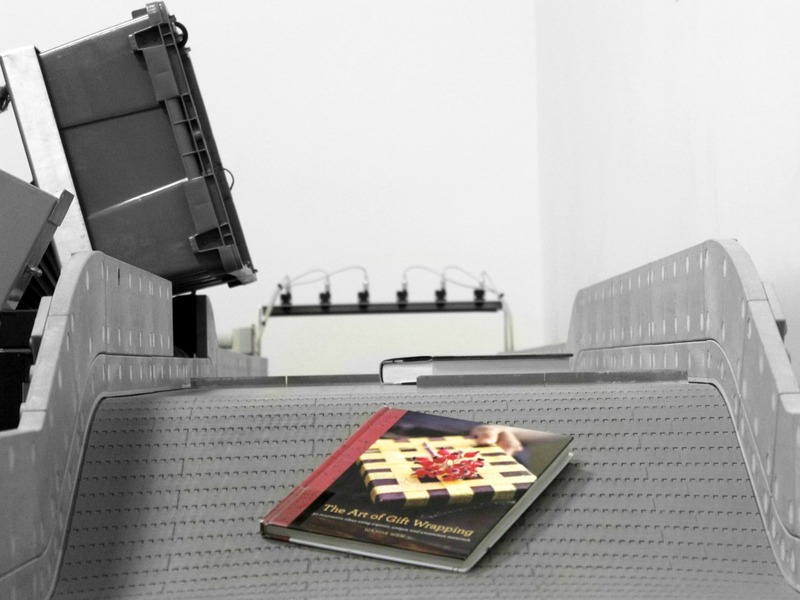 Our book is placed on the sorter in the back room of the Ladd Library and a slip is printed with the first three letters of our last name and the last four digits of our library card. 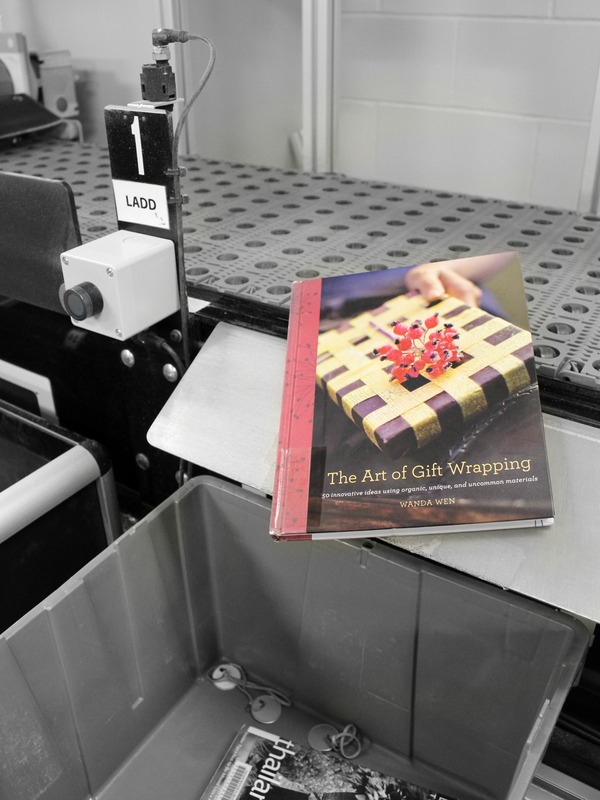 The slip is inserted into The Art of Gift Wrapping and the book is placed on a cart ready to head to the library hold shelves before the end of the day. At the Ladd Library, these are located near the front doors. At the Downtown Library, they are located near the entrance to the Children’s Library. 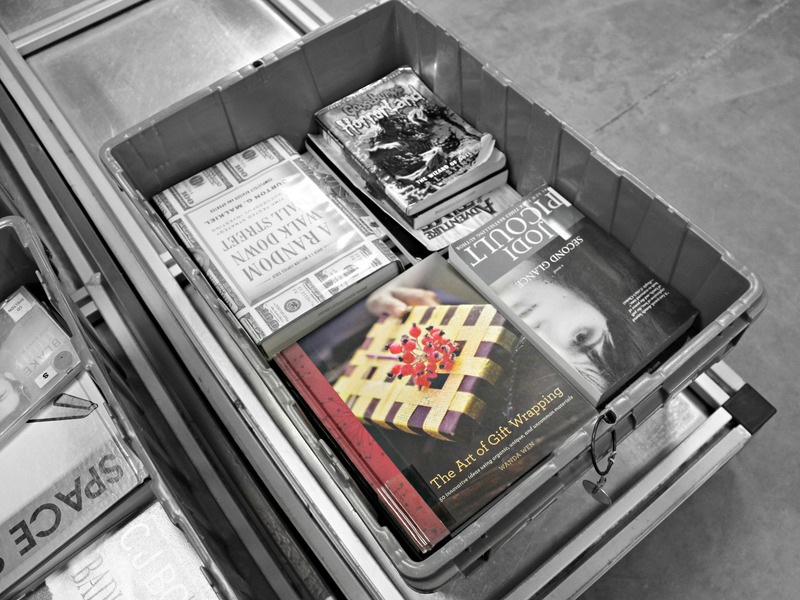 A volunteer or staff member bring the cart to the hold shelves and the item is placed there awaiting pickup. We have one week to pick the book up before it is pulled from the shelf by a staff member and put back into circulation or onto the hold shelf for the next person in line. Putting items on hold is easy to do and allows us to help you access the entire collection no matter which library you use, including our neighbors at the Hiawatha Public Library and Marion Public Library.